Martin Luther King Jr. Celebration public event with Chris Rudd, Founder & Lead Activator at ChiByDesign, who will discuss community activism, juvenile justice, and urban renewal. In 2014, youth from Chicago created a tech tool that opened up a needed path to a 2nd chance for thousands of their peers. Mr. Rudd will discuss the process these young people undertook to create the tool and the effects it has on the justice system in Illinois. Chris Rudd is a human-centered designer and community organizer with a passion for social justice. 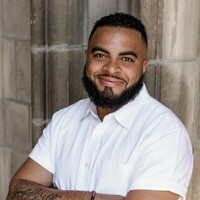 He has worked with youth on the South and West Sides of Chicago, challenging them to engage with their communities through activism and technology. Rudd has helped youth from Chicago to the Bay Area design eight civic apps, including Expunge.io. Rudd completed a year-long fellowship at Stanford’s Hasso Plattner Institute of Design (the d.school). As a Civic Innovation Fellow, he spent a year immersed in graduate courses learning, applying, and honing his skills in the human-centered design methodology. Currently, Rudd is working with the Institute of Design at IIT and leading ChiByDesign, a Black-owned and people of color-led human-centered design firm. ChiByDesign believes that empowering the people who are directly affected by issues with the tools and mindsets of design thinking can unlock limitless creative and effective solutions.